All mothers live in two worlds. One world is full of laughter, joy, and precious cuddles. The other world is full of potty training, tantrums, germs, and tears. Both worlds are important, and both worlds compete for center stage. Author Christi Cazin knows that motherhood is two-fold. Her days are chocked full of diaper changes, homework battles, sticky surfaces, and runny noses. Every day she wipes counters, packs lunches, and struggles to manage the chaos that surrounds her. She survives on obscene amounts of coffee and prayer to get through each day. Peace may sound like a distant memory for mothers, but it doesn’t have to be. Peace is freely available; all we have to do is know where to find it. Only God can give us true peace, and only He can help us survive motherhood. 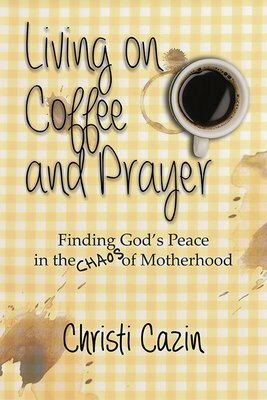 Living on Coffee and Prayer will inspire moms to embrace grace for their mistakes, trust God through their trials, and learn to truly value the vital role God has given them. Motherhood is messy, but it’s also a profound privilege. If God is the focus, the difficulties don’t have to overshadow the joys of parenting. The chaos won’t last forever, but thankfully, God’s peace will.